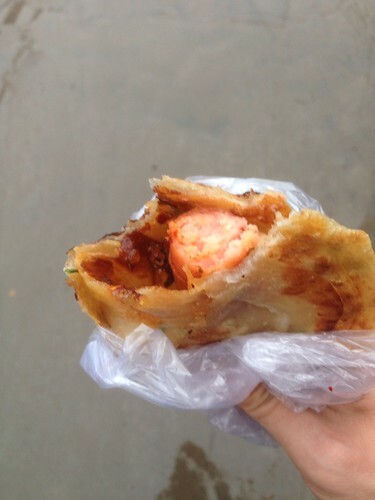 A Chinese prata with a hotdog (meat origin: unknown) for a modest sum of RMB 2.00 (SGD 0.40). I think it's a chicken sausage coz I spitted out a chicken bone fragment. Then again, it could be a bone fragment of a rat's femur. Siti, Muthu and XiaoMing would certainly baulk at it but honestly? It was rather yummy. So far, I haven't had any food poisoning as a result. Over here, their version of the same saying (or something similar to that effect) was "不干不净, 吃了没病". (Translate: Not clean. Not hygenic. Eat already not sick."